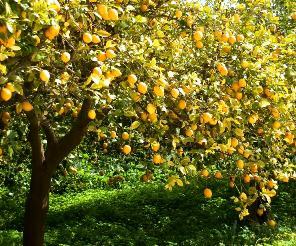 In late winter the lemon orchards in southeastern Sicily are a sight to behold, with trees so full of beautiful lemons that you can barely see the leaves. And while you’ll find lemons just about all year ’round, this is truly the perfect lemon moment, when the lemons are plump with the winter rain, bursting with juice and so fragrant that it’s hard to resist the urge to just bite into one. Astonishingly, these gorgeous lemons are hard to sell, as the wholesale market price is so low that farmers cannot afford to pick them. If you ask, most will tell you to pick them for free. On one such occasion, a farmer chided us for taking so few (a big bagful) and loaded another crateful into our car. All the while, he was muttering, “Niente, valgono niente”- nothing, they’re worth nothing. Heartbreaking, yet this made me feel compelled to make them worth something, at least in my own kitchen. Clean the brass faucet with lemon and salt. And my one copper pan. Grease and flour a 12-cup (3 liter) bundt cake or tube pan, and preheat oven to 325° F (170° C). Mix the milk and yogurt together and set aside (*alternatively, use 1 cup (220 ml) of milk with 2 tsp of lemon juice, and let sit 15 minutes). With an electric mixer, beat the butter until it is soft and fluffy, then beat in the sugar until light. Beat in the flour mixture alternately with the milk until well blended. Stir in the lemon peel and lemon juice. Bake for 50-55 minutes until a toothpick inserted in cake is clean. Remove the cake from the oven and immediately poke several holes in the top of the cake with a long skewer or toothpick. Pour a bit more than 1/2 of the Lemon Glaze over the cake. Let cake cool in pan for 20 minutes, then turn out onto rack. 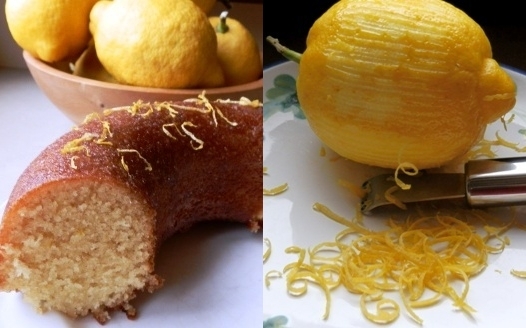 Mix 1 tsp of lemon zest into the remaining lemon glaze and brush or spoon it over the top and sides of the cake. Sprinkle the remaining tsp of lemon zest over the top of the cake. This recipe is delicious and my new favourite. My husband loves it too; and we thought we didn’t even like lemon cake. Thank you for sharing. Now if only I could post this on Pinterest. Glad you enjoyed this cake! I will see if there is a way to put this on pinterest, too. This recipe is delicious and my new favourite. My husband loves it too; and we thought we didn’t even like lemon cake. Now if only I could post this recipe on Pinterest. This is the precise recipe I was trying to find for my upcoming Sunday brunch (we never actually finish cooking until five p.m. for said brunches, but no one seems to mind too much). I\\\’m glad Google sent me to your blog! I love your evocative entries; I can almost taste the flavors of Italy while reading them. Thank you! Can this cake be made in a square or rectangular pan instead of bundt cake pan? I think it works best in a deep pan, rather than a low flat one, but I have never tried anything but a bundt pan.